Get ready, stargazers! The brightest and fastest shooting stars are expected to put on a show this month as the Orionid meteor shower happens Thursday and Friday (Oct. 20-21) and continue through early November. Bill Cooke, NASA meteor expert, said the Orionid meteors are special because they are pieces of Comet 1P/Halley, also called as the Halley’s Comet. This famous comet swings by Earth once every 75 to 76 years, so most people will have a chance to see it only once in their lifetime. “But every year, you can see pieces of Halley’s Comet during the Eta Aquarids [in May] and the Orionid meteor shower,” Cooke said. So stargazers can expect about 15 to 20 meteors per hour, but in some years, they have exceeded rates of 70 to 80 per hour, Cooke added. According to Cooke, you can spot them any night from Oct. 2 to Nov. 7. But the best part of the event is between Oct. 20 and Oct. 21, during the meteor shower’s peak. Recommended times to watch meteors are early morning and before dawn. Orionid meteors are visible anywhere on Earth and can be seen anywhere across the sky. They appear to originate in the constellation Orion, close to the bright-red star Betelgeuse. 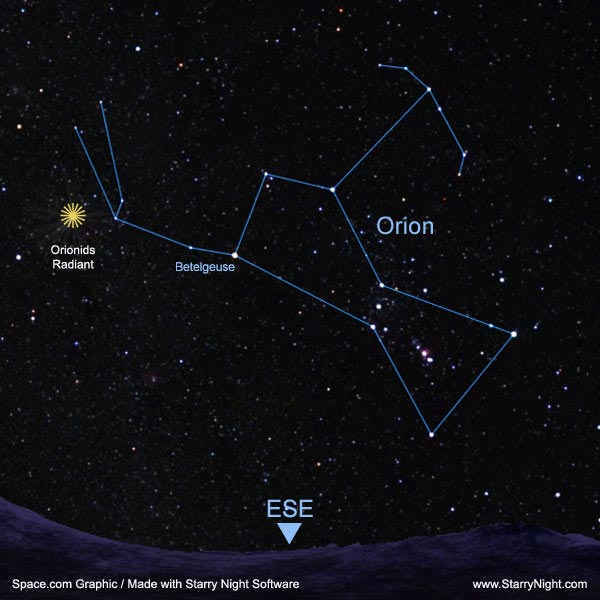 Find the shape of the Orion the Hunter, the meteor shower’s radiant (or point of origin) will be near Orion’s sword, slightly north of his left shoulder. But don’t stare straight at this spot,”because meteors close to the radiant have short trails and are harder to see — so you want to look away from Orion.” Cooke explained. The Truth Behind The Dress That Broke The Internet!